The University of Georgia Cooperative Extension-Cherokee County and Cherokee County Master Gardeners have partnered with the Sequoyah Library System to open a unique program at the Hickory Flat Library. 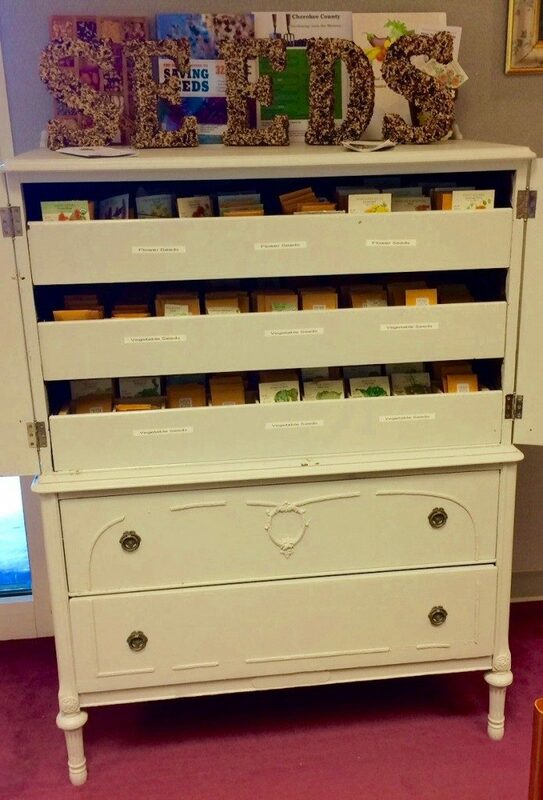 The Cherokee County Seed Library, which is housed in an antique dresser, is a place where gardeners can learn about seed saving and borrow vegetable, herb, and flower seeds. The seed library is actually a re-purposed antique dresser customized by Cherokee Master Gardener’s very own, Gerald Phillips. Seed saving is a time-honored tradition that allows the selection and perpetuation of plants that have particular value to a gardener, whether it is an especially early and tasty tomato or an especially vigorous and drought adapted hollyhock. Saving the seeds of favorite plants contributes to the biodiversity of local communities. Saving seeds also helps to connect generations within families; many gardeners enjoy the same beans or okra their parents or grandparents grew. 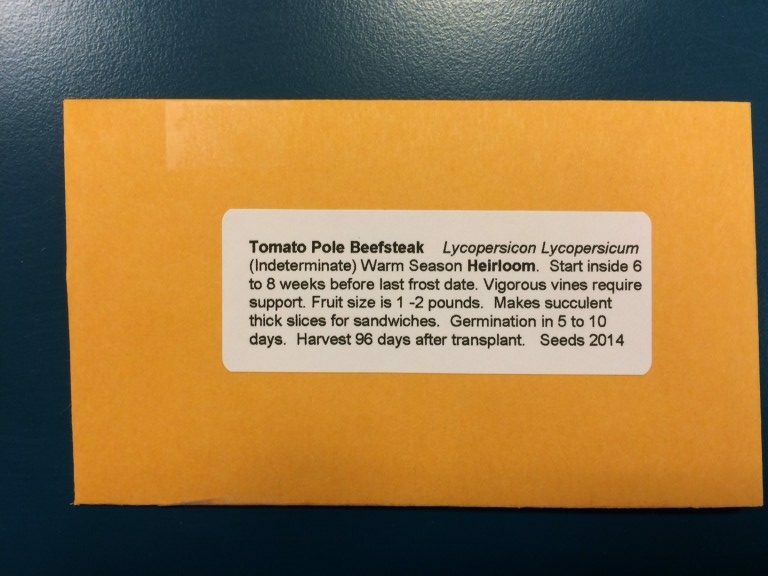 The Master Gardeners put a lot of time into packing seeds into custom envelops that contain all the information a gardener needs to know on how to grow each variety. The seed library is free to the public and interested gardeners are simply asked to fill out a membership form when they check out seeds. The seeds are organized by difficulty of seed saving and borrowers are asked to return some of the seeds from their succesful plants at the end of the season. As growers deposit seeds the seed library will maintain its inventory and will contain plants that are better adapted to growing in our unique growing environment. 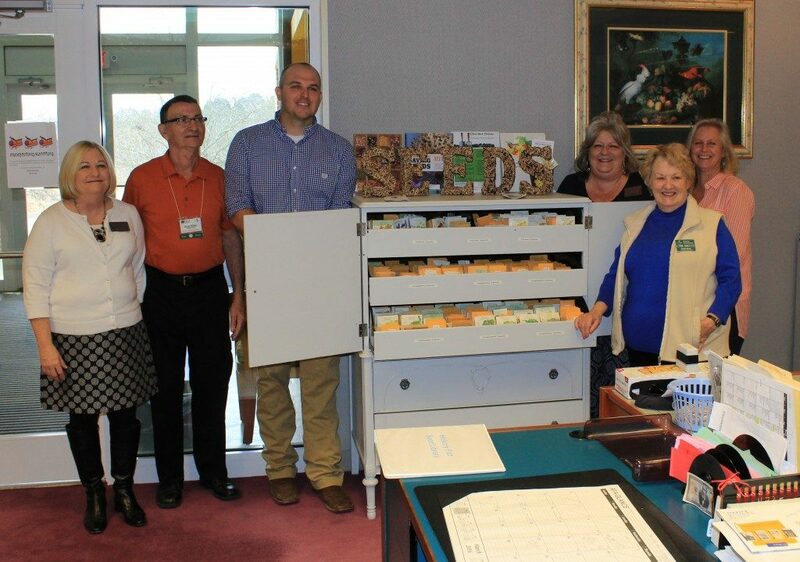 Here we are with Hickory Flat Library staff at the grand opening of the seed library back in March. In just over six weeks the library has seen over 40 people borrow seeds. The Cherokee County Seed Library is open during normal business hours of the Hickory Flat Library. Interested gardeners can also find information on the great public education programs led by The University of Georgia Cooperative Extension-Cherokee County and Cherokee County Master Gardeners at the Hickory Flat Library. Posted in Cherokee County, Flowers, Herbs, History, Home Gardening, Master Gardeners, Seed Catalogs, Seed Library, Vegetables. This entry was tagged community projects, master gardener, Seed Library, Seed sharing. Bookmark the permalink.